I love Alfred. That is all. Matthew must be the luckiest man on earth–heir to an earldom and heir to a sudden (and mysterious–didn’t Lavinia rat out her uncle because her father was heavily in debt?) fortune! It was a tad troubling to watch Tom rant about Irish independence–it was a serious and tragic matter, but are we supposed to want him to stop talking about it because he makes everyone uncomfortable? Edith’s pursuit of Sir Anthony! You go girl, even though I want you to find someone who pursues you first, not someone you fall for because he shows an ounce of kindness. MARY! Her snits were aggravating because the circumstances of Matthew’s inheritance were horrid and painful. It’s practically like dancing on poor Lavinia’s grave. Cora has the heart of a Who–I would have ripped Robert a new one over his arrogant handling of her fortune. When will Daisy learn to stop listening to Thomas? He loves to cause trouble, especially with Mrs. Patmore! Speaking of Mrs. Patmore, is anyone else loving her friendship with Mrs. Hughes as much as I am? Two things that underwhelmed me: Martha Levinson and Mary’s wedding gown. Thomas vs O’Brien is going to get deadly! Bates in prison is like a ticking time bomb. Reminds me of when he suddenly snapped on Thomas in S1. I’m glad to see Anna fighting to get him free when it seems that everyone else has moved on. Leave your ruminations and reactions in the comments below! Poor Anna, Bates in prison is indeed a ticking bomb! I began wondering if he is innocent because of how he snapped at Thomas and at his new mate in prison! I loved the Martha Levinson and Granny Grantham, they are seriously good – grand dames both of them, they could kill each other if they wanted! Thomas and O’Brien is going to become deadly I am sure of it! And it has started with Alfred, and it was O’Brien who went outside of her chain of command! And Mary’s wedding gown, beautiful and simple, loved the tiara! And about Matthew, I think he was a virgin! And the fight about the money from Levinias fathers money that was so mean of Mary! She behaved like a five year old about that! Loved all the comments and speculation on this series, but I live in the UK so saw the last episode in Series 3 two weeks ago and therefore must resist the temptation to reveal the storyline – and some of your foreshadowing does happen – but I wouldn’t dream of saying which ones. You’ll thank me later!! Thank you, Anita, for NOT spoiling the series for us here! I, too, felt Mary acted like a spoiled 5yr. old, but she has been spoiled her life long. I was wondering if there would be a tiara, after all she IS an Earls daughter. John Bates has been in prison before, remember, and fought in a war. It’s not beyond the realm of possibility that he could be violent especially, when backed into a corner, as could we all! The sniping between the “Granny’s” was priceless and could have been true. My mother & my ex in-laws didn’t get on well, so I saw some of the like in my life. Can’t wait for DA 3:2 & beyond! Thank you, Anita, for NOT spoiling the series for us here! (1) I would have had Edith accept her fate as the unmarried daughter-sister-aunt (not uncommon in postwar Britain) rather than pursue a much older man with few redeeming qualities. Perhaps she will yet. (2) The desperate search for another fortune by Mary with the collusion of Granny Crawley was unseemly revealing an avariciousness that I had not appreciated even after her willingness to accept a loveless marriage to the wealthy Sir Richard Carlisle in S-2. (3) The introduction of Mrs. Hughes’ cancer created a new story line with poignant possibilities downstairs. I like it when the script inserts bits of history for us: there were a LOT of young woman who could not marry in this generation due to the lack of men. Ihad two dear gran-Aunties who lost fiance’ in the great war and stayed alonge all their lives. I don’t think Mattie was virgin – why else did he so easily forgive Mary for her indescretion? While Mary could have should a little less panting about the money, As someone mentioned above it appears the $$$ may be ill-gotten gains to begin with so why invest it with such a holy sense? mary could have brought up that point. I really have got to replace this crummy keyboard. Sorry for the typos! 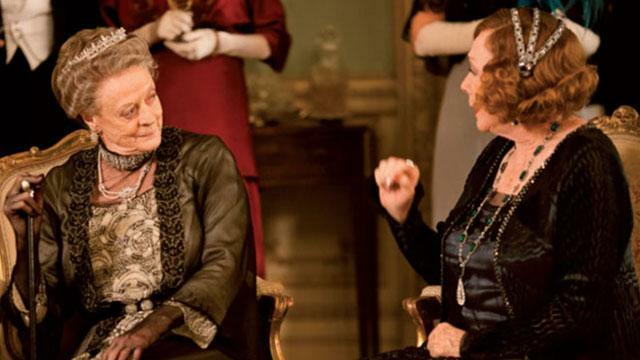 I was also very touched by Mrs. Hughes and Mrs. Patmore’s friendship and caring toward each other. Mary’s wedding dress and the church setting were lovely. I wish we could’ve seen more of the ceremony. I did not enjoy Shirley McClain as Cora’s mother, and I thought her character showed Americans in a poor light. But I know some British did not appreciate Americans, even with all the money they brought to England. I will look forward to next week! Dammit, I totally missed the Is-Matthew-a-Virgin conversation! I bet he did it once with an older woman when he was like 14 and it was so traumatic he decided to hold off until marriage. I thought it was cool to see the outsiders , new additions to the family pull together to help each other. Matthew giving advice to Tom Brandon, Matthew standing in defense of Tom when it was revealed that he’d had his drink messed with hi head by announcing him as his best man, Tom going to Matthew and getting him to go talk to Mary between the doors. I felt that they were pulling n the group in a wonderful way. I don’t think that Robert, the Earl of Grantham was being arrogant by investing poorly. Every investor knows there are risks. And about Mary being wild about anything to keep Downton, this is where she had grown up with expectations that she would marry and live out her days there. Notice after they are back from their honeymoon, how she and Matthew are lying awake in the first morning light and her words show she is accepting it, not that she wants to, but because she has accepted that there are compromises one must make in life. I think she and Matthew understood more than most that England was a new world. I can’t wait for next Sunday! Did I miss Lady Rosmund Painswick at Mary’s wedding? She is, after all, Mary’s aunt, Lord Grantham’s sister and daughter of the Dowager Countess. And I wonder if Richard Carlisle gave the wedding much ink in his newspapers. I do agree that it is odd that Reggie had enough money to save Downton but Lavinia had to save him from the debt to Sir Richard. Perhaps he was just a cheap lawyer! I am baffled by why they need the money from Matthew at all. Isn’t Lord Grantham’s sister wealthy? Why can’t she help out? Where is Rosamund? Also, I think the view of Mary as avaricious is a bit harsh. If my home and my whole way of life was about to be ripped out from under me, I doubt I’d be sweet as pie about it. Also, Mary did marry Matthew when it came down to it, and I thought she handled it pretty well after they were married. The one I didn’t get was Matthew. I think being all noble about Lavinia’s money was just plain silly and a bit selfish. An entire village depends on Downton for its survival, but he’s willing to make everyone endure hardship because he has some twisted idea of being noble and easing his guilt? I wanted to slap him up the side of the head. Thank you for mentioning the rather mysterious nature of Mr. Swire’s fortune. It’s not impossible of course, but a bit too deus ex machina for me. I also must be incredibly dense, but are the Crawleys trying to sell Downton as various spoilers I saw before s3/recaps claim or do they just need to lease it? If the former, I don’t understand how that works legally, because isn’t the point of an entail so that they can’t sell the estate? And I agree that Mary is a bit spoiled brat about the money, but I also want to slap Matthew for still being all “we killed her.” And I wouldn’t have minded seeing more of the wedding, especially the reception – dresses! pretty people! food and flowers! – especially as M/M immediately became much less interesting to me post wedding. I believe the actress who plays Rosamund missed the wedding because of other commitments. Too bad there was no comment about how the steamer returning her from India had broken down at that vile Port Said. Or some excuse about why she missed the wedding. Rosamund’s husband left her well fixed but I doubt she has the vast piles of cash to give her brother. Who should NOT have invested everything in one railroad. Shirley Maclaine was mostly wasted. Yes, we know you are American. And why was she shown to have such dreadful table manners? Charles Hayes’ death was given as one of the causes of the Grand Trunk Railway’s failure. Charles Hayes died in Titanic and the Grand Trunk Railway failed in 1920, eight years later, more than enough time for Grand Trunk Railway shareholders to evaluate the effect of Charles Hayes’ death on their investment.